Prenatal documentation is the foundation of the clinical journey of expecting mothers and unborn babies. I work in an HIM department at Winnie Palmer Hospital for Women and Babies in Orlando, Florida, where my primary responsibility is getting the prenatal record into the correct EMR account in a timely manner and supporting clinical providers in their quest to give quality care. 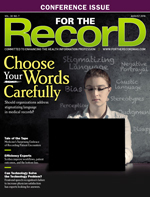 Inaccessibility to the prenatal record not only affects the quality of care while the patient is being treated but also creates a ripple effect outside of the treatment plan. For example, it affects the accuracy and quality of data collected for public health practices, policy measures, and maternal and infant health research. Established in 2010, the Florida Perinatal Quality Collaborative (FPQC) brings to light how inaccessibility and poor data quality impact multiple variables. FPQC's goal is to improve Florida's maternal and infant health outcomes through the delivery of high-quality and evidence-based perinatal care. Multiple projects have been enacted by the FPQC consisting of statewide partnerships with perinatal-related organizations, health professionals, advocates, policymakers, hospitals, and payers. One of the current projects is the Birth Certificate Initiative (BCI), a statewide effort taking place at nine hospitals, including Winnie Palmer Hospital. The initiative's goal is to improve the accuracy of birth certificate reporting to promote better health care and public health efforts. The project's formal goal was to improve the accuracy of 22 key birth certificate variables to the set benchmark of 95%. Out of the 22 variables, eight are impacted by having the prenatal record as its source. Months of data collection from the participating hospitals, conducted by the FPQC, revealed that the variables "number of prenatal visits" and "mother's prepregnancy weight" were lacking. Beginning in February 2017, the estimated inaccuracy of data was 68% for prepregnancy weight and 61% for number of prenatal visits—drastically below the 95% benchmark for those variables. It was determined the results of these variables were substandard due to a lack of accessibility to the expecting mothers' prenatal records. Participating hospitals voiced concerns about being unable to access prenatal documentation from obstetrician physician offices and through the hospital's EHR. As the corporate HIM analyst at Winnie Palmer Hospital, it is my responsibility to ensure prenatal documentation is accessible to the clinical team. As a result of the findings of the BCI, it was determined that the focus of my role needed to increase and I needed to exert more control. Therefore, I had to expand the process to the point that the record was accessible to not only the clinical team but also the birth registry team. Prior to becoming involved in the BCI, I was tasked to create an instructional guide for the prenatal record process. The guide was to explain how prenatal documentation is received, how it's entered into the EMR, what happens when it's sent to be scanned into the EHR, and the follow-up process after scanning takes place. During one of the BCI training webinars, there was a discussion on how to create a process flowchart to help gain a better understanding of workflow, define boundaries, and identify process effectiveness measures. As a result, I created a workflow diagram (see chart). This workflow diagram has assisted me in reevaluating certain tasks in the prenatal documentation process in order to make it simpler. 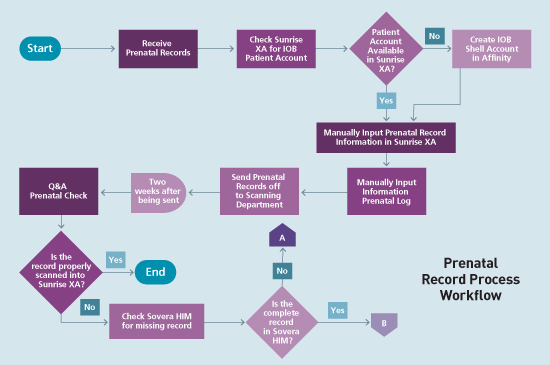 Also, it gives me the capability to explain the process visually and illustrate why the prenatal documentation may not be accessible in the EHR. After a year of training webinars and data collection, the first phase of the BCI was completed in February. The results offered valuable insightful into how Winnie Palmer Hospital and the other eight organizations altered their process of obtaining prenatal records. The accuracy of the 22 birth certificate variables increased from 89% to 94%, a tick below the target of 95%. Despite failing to reach the goal, the gradual increase is encouraging—as is the fact that all of the participating hospitals saw improvement. Among those variables impacted by accessibility to prenatal documentation, the number of prenatal visits increased its baseline by 17.5% and prepregnancy weight upped its accuracy by 11.9%. Although neither variable met the 95% benchmark (the number of prenatal visits was 78.5%, and prepregnancy weight was 79.9%), the gradual growth demonstrates that the right decisions are being made for improvement. After a year of being involved in the BCI, I expanded my thought process of how the prenatal process should work. Perhaps most importantly, I realized the process isn't solely for clinical treatment. I also learned that three traits are vital to making the prenatal process successful: accessibility, communication, and standard setting. Without access to current prenatal documentation, those who need the documentation must "assume," which can lead to faulty and inconsistent information collection. Establishing open communication between birth registrars, staff, and HIM management and enacting guidelines on how to share documentation makes it easier to access patient records. To create effective standards, every staff member's role must be taken into consideration. Without solid communication between the physician's office, management, nurses, HIM, and others, the goals and standards can't be met. For example, at Winnie Palmer Hospital, the fact that the scanning department is offsite and it will take them some time to scan the prenatal record into the patient's file is taken into account. As prenatal documentation training at Winnie Palmer Hospital continues, the flowchart has become the main visual tool. During training, staff and management have asked me questions, tested the process, and provided feedback, all of which afford me the opportunity to improve the facility's prenatal documentation. As a result, we can further the FPQC's mission to "improve Florida's maternal and infant health outcomes through the delivery of high-quality and evidence-based perinatal care." — Brittany Biggett, RHIA, is an HIM professional sustaining the integrity, privacy, and security of protected health information.